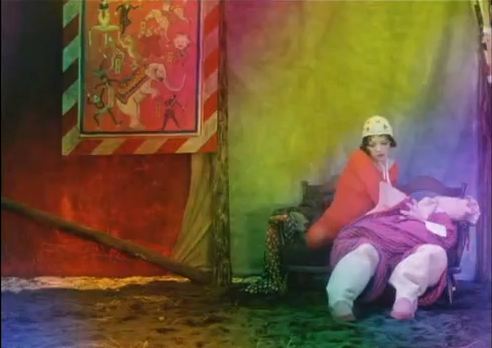 In February, BAM/PFA hosts the special film series "Chronicles of Inferno: Japan's Art Theater Guild," a retrospective of ATG films from the late 1950s through the early 1970s. The following "Media Histories / Media Theories & East Asia" conference speakers will introduce films in the series: Roland Domenig will introduce Silence Has No Wings on Thursday, February 7th at 7pm and She and He on Saturday, February 9th at 8pm; Hirasawa Go will introduce Ecstasy of Angels on Friday, February 8th at 7pm; Julian Ross will introduce Children Who Draw on Sunday, February 10th at 3pm; Miryam Sas will introduce The Inferno of First Love on Sunday, February 10th at 5pm and Pastoral: Hide and Seek on Thursday, February 14th at 7pm. For further information concerning this special film series, please refer to the BAM/PFA website. "Fragments of Japanese Underground Cinema (1960-1974)"
In February, YBCA hosts "Fragments of Japanese Underground Cinema (1960-1974)," a film series that features "a selection of radical highlights with historical significance from Tokyo's counterculture during a politically fervent and socially subversive period of its recent history." The series consists of four film programs screened over four days: "Gewaltopia: Motoharu Jonouchi's Radical Visions" on Thursday, February 14th; "Films by the Group of Three: Iimura, Obayashi, Takabayashi" on Saturday, February 16th; "Expanded Cinema and Intermedia: Films by Terayama, Matsumoto and Miyai" on Thursday, February 21st; and "Michio Okabe's Crazy Love" on Thursday, February 28th. The programs "examine early experiments in collective filmmaking with the Nihon University Cinema Club; home-movie formats adapted for the purposes of artistic expression with the Group of Three; the redefinition of collage-film with Motoharu Jonouchi’s and Michio Okabe’s film-documents; an expansion of cinematic vision with a multi-projection program; and all-out anarchy with poet Shuji Terayama’s foray into film expression." This film series is co-curated by Hirasawa _Go and Julian Ross, and co-presented by the San Francisco Cinematheque. For further information concerning this film series, please refer to the YBCA website. "Gutai Historical Survey and Contemporary Response"
In February and March, SFAI presents "Experimental Exhibition of Modern Art to Challenge the Mid-Winter Burning Sun: Gutai Historial Survey and Contemporary Response," the "first West Coast survey of Gutai (1954-1972), a significant avant-garde artist collective in postwar Japan." 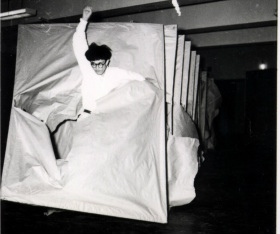 This two-month exhibition "investigates an array of classic Gutai performative activities: smashing paint-filled bottles; full-body engagement with mud and cement; leaping through a series of paper screens; painting with feet. At the exhibition's opening reception, Bay Area artist and SFAI alumnus Guy Overfelt will break open the plane of painting atop a motorcycle in response to Saburo Murakami's 'Passing Through' (1956). Jeremiah Jenkins, also a local artist and alumnus, will respond to Kazuo Shiraga's 'Challenging Mud' (1955) by taking on the materials as a professional wrestler, complete with WWF-style theatrics." In addition to the Gutai works on display in the Walter and McBean Galleries, SFAI will also present a series of exhibition-related events including a lecture, a panel discussion, and a film screening. This exhibition and all its associate events are FREE and open to the public. For further information, please refer to the SFAI website.